Location: Nr Rio Magdelena, Huila, Southern Colombia. Grid Reference: 1° 52' 54" N, 76° 15' 47" W.
Elevation 1,800m. 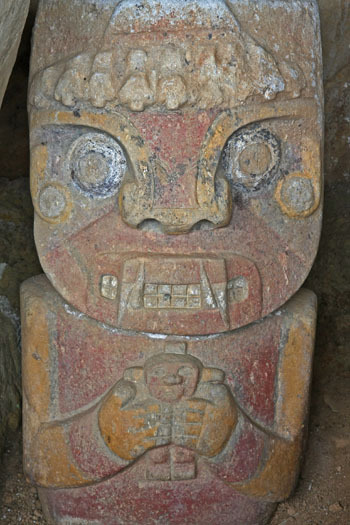 Some 500 statues and tombs are scattered in groups over an area on both sides of the Rio Magdalena Gorge. The town of San Agustin is set in the middle of the valley and is the best place from where to visit them. 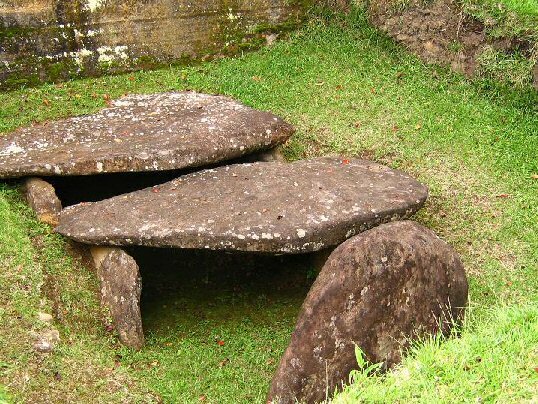 The dozens of megalithic sites nestled in the valleys of the Magdelena River combine to make this site exceptional. The site are composed of mounded tombs, dolmen-like structures and monolithic stone structures (linked to the 'Jaguar cult' by some-see right). 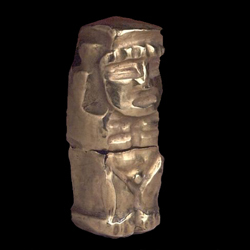 The pre-Incan civilization that lived here is shrouded in mystery, even their actual name is still unknown. 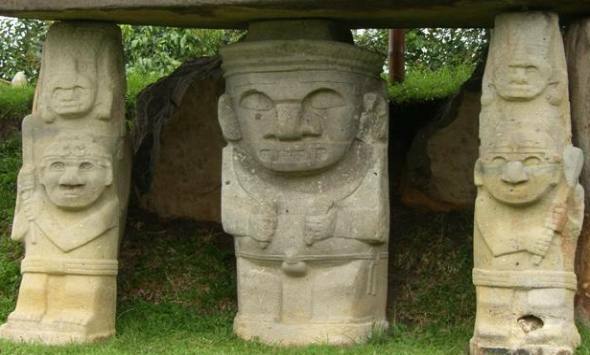 Archeologists have uncovered a mere 10 percent of the statues and ruins, and it is theorized that huge mayan-like pyramids and other structures remain buried throughout the area. Other than the amazing statues, you can see burial chambers and ritual edifices in the Parque Arqueologico and huge petroglyphs spread throughout the valley. There have been comparisons made with the Mayans of central America, and if you follow the Rio Magdalena north from San Agustin you will see that it begins on the Atlantic coast of Colombia very near the equally famous ruins of the "Ciudad Perdida," a likely landing point if the Mayans took a boat ride from the Yucatan Peninsula or crossed the Darien Gap into Colombia from Panama. 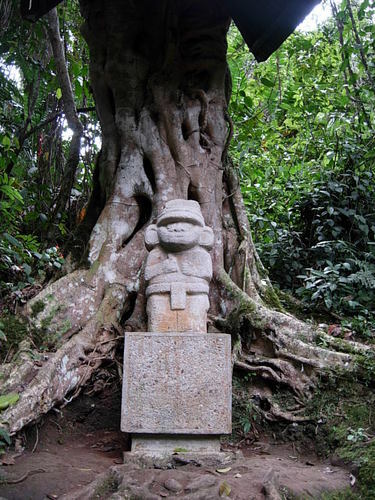 It should be noted that carbon dating between San Agustin and Ciudad Perdida matches the same general time period of 555 BC to 1630 AD (from "San Agustin" by Reichel Dolmatoff, 1972). As far as culture and society, archaeologists have determined a few things: The San Agustin people treated women as equals and superiors (they did have female leaders), they had a grasp of advanced mathematics, they attempted complex surgeries and they were obsessed with the idea of life after death. 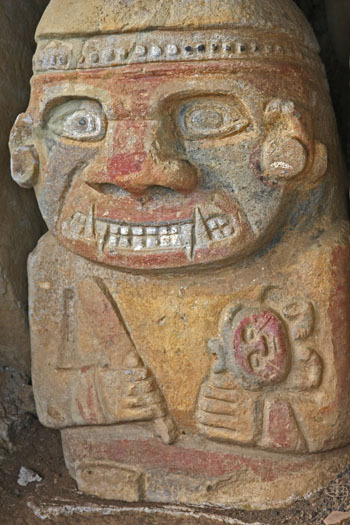 People were ritualistically sacrificed, burned alive and sometimes buried alive under the influence of hallucinogens. 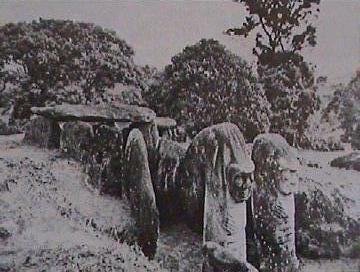 The Dolmen/Passage grave (below) is a mixture of both European and Olmec art (Jaguar cult). 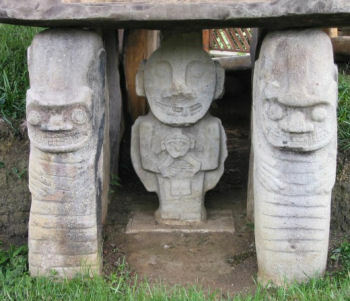 Some of the structures share a similarity in design with European megaliths. 'The San Agustin region is located in the upper Magdalena River valley and is framed by the Central and Eastern Cordilleras. 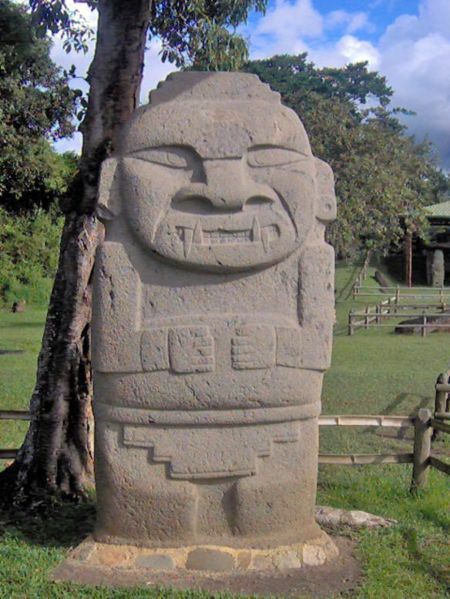 As the site of the most striking progression of monumental statuary, this part of Colombia has long attracted the attention of social scientists. The ethnic history of the region has been interpreted based on two different chronologies. One of them, established by Luis Duque Gomez and Julio Cesar Cubillos, postulates the theory of continuous development separated into an Archaic period. from 3300 to 1000 B.C., a Formative period divided in two phases: (Inferior, from 1000 to 300 B.C_ and superior. from 200 B.C. to 200 A.D.), a Regional Classical period from 300 A.D. and a Recent period from 800 A.D. until the arrival of the Spaniards. The other chronological theory was developed by Gerardo Reichel-Dolmatoff. According to this archaeologist there might have been three principal phases, marked by abrupt changes indicating the arrival of different peoples. These stages are defined as: Horqueta, the beginnings are undecipherable but it ends in 50 A.D.; Isnos, from 50 to 400 A.D., and Sornbrerillos from 1400 to 1650 A.D. The two opinions coincide on some significant points. 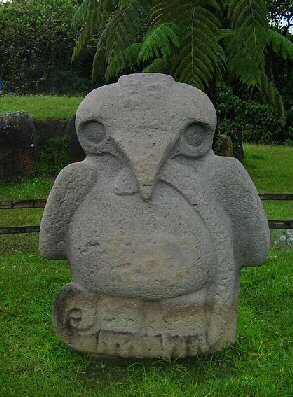 Firstly, that the development of monumental architecture, one of the most characteristic remains of the region. corresponds to eras prior to the Spanish incursion. Duque and Cubillos place the statuary's maximum level of development within the Regional Classical period. from 300 to 800 A.D., while Reichel-Dolmatoff has determined the highest development to have occurred between 50 to 400 A.D.. during the Isnos phase. Secondly, they concur that the builders of the mounds and statuary belong to population phases associated with an era during which the local economy was heavily dependent upon the cultivation of maize'. 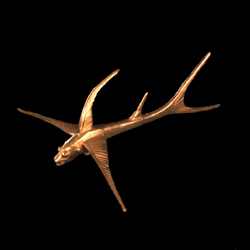 Gold-working development follows along the following lines: In various parts of the region, hammered gold tubular and round necklace beads, diadems, wires, nose ornaments, gold rings with stone beads, H shaped diadems and gold covered seashells have been discovered throughout the region in association mound burials. These objects, which correspond to the statuary development, reflect ties with Calima, southern Imabaya and Tolima goldwork developments. On the other hand, the discovery of smelted drops of gold and fragments of golden sun rays in addition to the presence of alluvial gold in the regions's rivers - particularly Manzanares and Sombrerillos - point to the local production of those metallic objects. Gold items discovered at San Agustin. 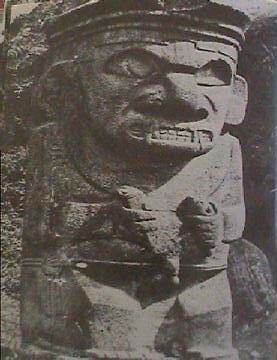 Jaguar god (left), and bird with snake (right). Two of the 'Dolmen-shrines', common in the area. The area is littered with beautifully decorated stone statuettes. 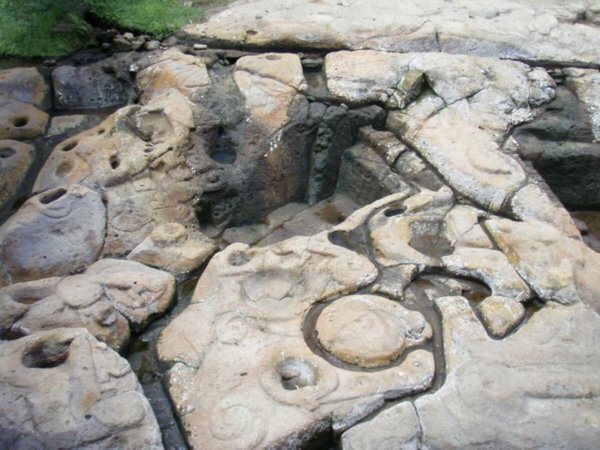 Carved river beds were a common feature in Oriental and South American architecture..
1). D. Zink. The Ancient Stones Speak. 1979. Musson Book Co.